A proposal to ask voters to raise Missouri’s fuel tax 5.9-cents is now before the House Transportation Committee. It’s the first step in whether the House will eventually vote with the Senate, and ask voters to increase Missouri’s 17-cent fuel tax, to pay for roads and bridges. 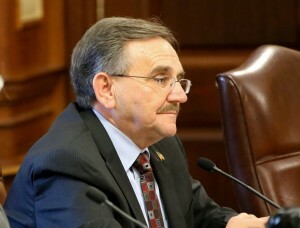 Representative Don Rone (R-Portageville) said it wouldn’t be popular in areas like his, where not as much money is spent on road work, as is collected in their region. McKenna said the Department sees things differently. “We look at it in terms of where the vehicle miles are traveled, not necessarily where the receipts … where the purchase of gas occurs because that’s how we look at the entire system, is really where the usage is,” said McKenna. Representative Bob Burns (D-St. Louis) told the bill’s sponsor, Senator Doug Libla (R-Poplar Bluff) he hopes the proposal will pass. “I hope we don’t have a bridge collapse or a roadway collapse where we kill a family or kill more people [before] folks realize this has to be done,” said Burns. Libla told the committee the state has put off for too long creating additional revenue for roads and bridges. “Here we are. Our house has got a leak up in the roof, sheet rock’s getting ready to fall in, and it’s getting ready to leak down on your favorite recliner that you watch your baseball game in. That’s how far we’ve gotten on this highway preservation and maintenance, so we’ve got to move forward,” said Libla. House Republican leadership does not favor increasing taxes to pay for roads. The committee will likely vote this week whether to advance the proposal.